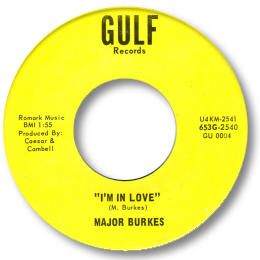 Singer/guitarist from the 12th Street district of Austin, TX, Major Burkes cut 2 excellent 45s for Bill Quinn’s Houston based Gulf concern in the mid 60s. Like so many singers who recorded in that neck of the woods during that period, the Major was clearly influenced by Bobby Bland. And while he might not have had the maestro’s vocal authority his lighter baritone certainly showed the right approach, and the way he phrased his songs more than made up for any lack of grit. It’s also worth noting that he wrote all four songs that came out. As was pretty common in the Golden Age each of his 45s had an uptempo and a ballad side. His first deep release was a real gem. I’m In Love was as mournful a blues ballad as you could wish to find. Love the way Burkes works his way round the sad tale, and the Bland stylings are just superb – right down to the horn lines and the subtle guitar figure at the run out groove. 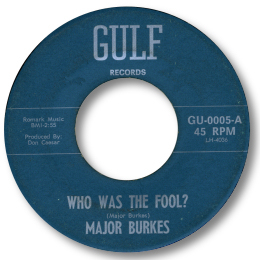 His other slowie Who Was The Fool is taken at an even more funereal pace, and if anything Burkes sounds even more distressed as he discusses his relationship break up. Another very fine performance. UPDATE ~ Major Burkes has written a book about his life and music in Texas entitled "In The Shadow Of Austin". You can find the details here. It is a very interesting account of his life and times in the music business - well worth reading. Special thanks to Alex Subinas (see Links) for the exciting update and to Pete Nickols for the ad below..